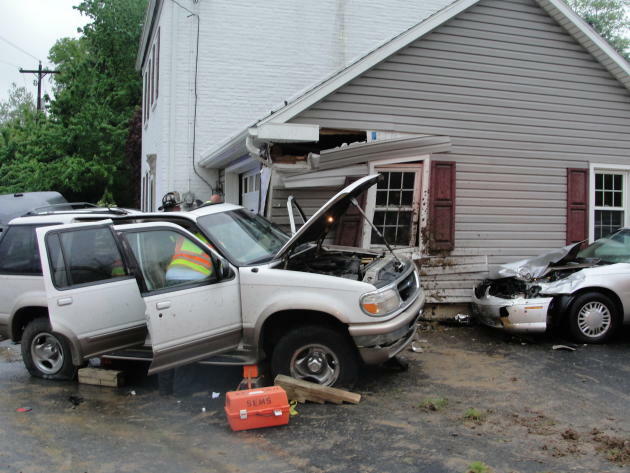 A Pennsylvania couple has found themselves in an all-too-familiar situation this week when a car crashed into their home for the fourth time, the third time in the past six months. Sonya and Wade Schenewolf, of Easton, Penn., were getting ready for their day on Tuesday morning when they heard a loud booming sound from outside. Unfortunately, they knew what it was before going outside. A car had hit their house, again-the third time that's happened in just the last six months. "My house got hit in December, my house got hit in March and my house got hit in May," Sonya Schenewolf said with disbelief. "And a year before that, my car and my garage got hit." She has had serious damage to her garage, car and front porch from the various accidents. "This is a 30 miles per hour zone. We do live on a curve and our house is close to the road, but, recently, the township put in a two-lane bridge directly across from my house," she said. "If you come across that bridge and you don't stop, you're in my house." Schenewolf said Tuesday's accident was caused by a speeding driver. She believes he was going approximately 65 mph in the 30 mph zone. "He was actually airborne when he hit," she said. The driver is in the hospital with injuries, but is expected to make a full recovery, according to Schenewolf. The couple has wanted to put a boulder in front of their house to prevent accidents from damaging their home, but they said they have been told that such an obstacle would make them liable for any damage to a rogue driver. "The thing that's frustrating is that I was told by a few of the rescue workers that my car, which was parked there and is totaled, is what saved [the driver's] life," she said, adding that a boulder would have saved him without wrecking her car. Tuesday's accident happened just 15 minutes before Wade Schenewolf was about to head to his car in the driveway to leave for work. "If we would have been in his vehicle, he would have been killed," his wife said. She estimates that she has $40,000 in property damages and the man who hit the house has $5000 in property damage coverage. The couple plans to go to township officials to fight for a boulder. "I want a pretty heavy duty one," Schenewolf said. "A truck would have to bring it in. It has to be significant to slow a car down."